Lady Jewels is this web page mascot. She is the image of the exaggeration of brightness and colour ! 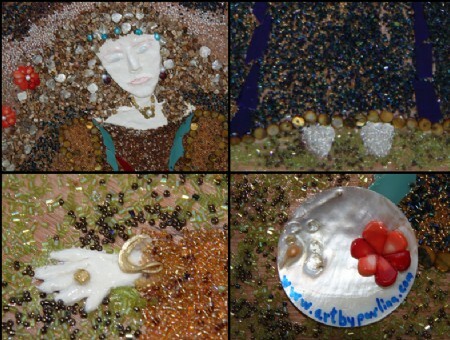 She is made of thousands of sparkles and stones,corals,pearls and beads. Like a true Lady she is of course wearing all her jewellery for a stroll in the woods! Notice she didn’t forget to wear her rings, her bracelet, her earrings and her necklace ! This mascot will bring on these kind of artworks in the future!